Doctor Who: THE WITCH'S FAMILIAR Spoiler Filled Review | Warped Factor - Words in the Key of Geek. Oh look, surprise, still not dead, says Tony Fyler. As false cliffhangers go, there are those that make you genuinely wonder, and there are those that overplay their hand. The Magician’s Apprentice…well let’s just say at the end of the episode, my non-Whovian but long-suffering wife turned to me and said ‘I don’t buy that for one second.’ The Moffatty timey-wimey no-one’s-ever-really-dead-ness is strong in this one. When you push the stakes too high, you’re left with either an RTD-style deus ex machina, or something enormously convoluted and clever, or you’re left with ‘I’m the Doctor, just accept it,’ as a way of carrying on beyond the point of ultimate cliff-hangery. So Missy’s not dead, Clara’s not dead and off they jolly well pop, allies with a pointy stick against the heart of the Dalek empire. The pre-credits sequence of The Witch’s Familiar has a sense of existing merely so Missy can be enormously…Missy about things, and in terms of drama, it’s not a patch on The Magician’s Apprentice’s pre-credit sequence, but it does at least take the trouble to explain both the deus and the machina not only of why she and Clara are not dead from Dalek weapon fire, but also why she didn’t die at the end of Death In Heaven. And with that, and with the weirdest alliance forged, off they skip, with nothing but a pointy stick and some self-belief, to take on the Daleks. In the heart of the Dalek city, the Doctor and Davros are reaching a crisis point, showing us something new – for all he’s got a reputation of being a grumpy Doctor, Capaldi’s Twelfth hasn’t done outright rage very often, but here he’s pointing a Dalek gun at Davros’ head, not solemnly as the Fifth Doctor did it, but angry, furious, demanding – leading to one of the best sequences in recent years, which will probably be forever known as the “Anyone for dodgems?” sequence. Ultimately though, the Doctor’s faffing about in Davros’ chair doesn’t achieve much in story terms, and it’ll be interesting to see whether Capaldi’s favourite scene of the two-parter stands up to the test of time. There’s a sense in which the whole “Of course the real question is where did he get the cup of tea. Answer: I’m the Doctor, just accept it” could be taken as a one-finger salute from Moffat to all the fans who take life too seriously, and/or those who demand there be some logic in the storytelling. So – that’s us told, then. Before long, we’re back in the dinge of Davros’ chamber, where the prevailing mood for the rest of the episode is confessional. 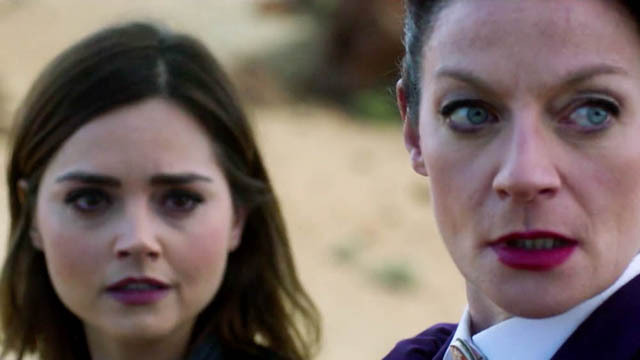 By contrast, Missy and Clara’s ‘hero quest’ into the Dalek city is mostly played for laughs, albeit sometimes, dark laughs with some solid characterisation, particularly of Missy – the face she makes while Clara’s hesitating to kill her channels at least Ainley and Simm, and possibly a little Delgado too, into the uniqueness that is the Gomez interpretation. The throwing of Clara into a potentially bottomless pit is telegraphed just a little too much to deliver the crisp laughs it’s looking for, but still, it underlines how Missy sees the universe. “Every miner needs a canary,” indeed. Before it was open to the world’s scrutiny, those who’d seen the two parts tended to agree that most of the things that stopped it from ending up on the All-Time Classics List were in the second part, and for me, the whole Dalek sewers thing is one of them. It feels not only like convenient creation, but also a slightly unfortunate re-writing of Steven Moffat’s Curse of the Fatal Death, with the Master spending centuries crawling through endless sewers while the Doctor hopped back in time to assure his own ultimate victory. This time though it’s played for drama, rather than outright laughs. It’s also slightly unfortunate, when dealing with sewers, for the liquid that occupies the Dalek you murder to be brown. You can call it ‘decayed Daleks’ all you like, but on the playground next week, The Night of the Dalek Poo-Storm will be played out up and down the country. It’s a concern that resonates of course in the ending, as the whole Dalek city is consumed by Dalek sewage. There are some really interesting lessons on the way – the incapacity of a Dalek to see anything outside its species as anything other than an enemy to be exterminated, the idea of them continually screeching “Exterminate!” as a way of recharging, which is genius. Missy’s goading of the Doctor to kill the Clara-Dalek is gloriously mischievous, and her notion of Clara being ‘the friend within the enemy, the enemy within the friend’ should be enough to start the fan theories roaring, particularly as regards the way she ultimately leaves the Doctor. But sewage – even Dalek sewage – still feels like an unfortunate image as it vanquishes the greatest pepperpots in the galaxy. The meat of the episode, the conversation between the Doctor and Davros, is a pure fangasm in celluloid, and contains some of the best moments we’ve seen in New Who so far – including a quiet moment of self-definition by the Twelfth Doctor (“If I try, very hard, then on good days, I’m the Doctor, I’m not just some old Time Lord who ran away,”), and most surprisingly, Davros’ rationale for being happy that the Time Lords are back in the sky somewhere. That’s masterfully written, because it takes us back to Davros the man, Davros the Kaled, before the Daleks were even a reality in the cosmos. These two, talking like ageing citizens of a scarred and battle-weary cosmos is a thing of wonder, Bleach more than holding his own against Capaldi, and investing the scenes with a true equality, these two old men of the stars sharing memories and philosophies that no-one else would really understand. But along the way, there are unfortunate – if necessary – moments. The prophecy from Gallifrey is mentioned in about two lines, but it comes out of nowhere, with no foreshadowing whatsoever, and turns out to be the rationale behind Davros’ plans. The opening of Davros’ ‘real eyes’ is a moment that’s made more than some fans go ‘hold on a freakin’ minute – Davros has always had EMPTY sockets, hasn’t he? Not just closed, working eyes!’ We understand why it was necessary – it’s a sentimentalist game-changer, the old man, looking at his sunrise through his own eyes once more, and his being unable to do so works as the spur to the Doctor’s compassion – but it’s pretty much re-written for the sake of that moment what most fans have always understood about the anatomy of Davros. Presumably the angry mob is already on the march. But most of all, there’s the lost opportunity for impact. If Davros’ story had been true, all that wonderful work that was put into the conversation between him and the Doctor could have stood as a testament to the man who invented the Daleks. But having it all be a ploy to get the Doctor to re-invigorate him and the Daleks feels not only weak, but ever so slightly cheap as a way of ending the story. What’s more, we’re not really sure what it says about the Doctor – the Doctor who claims he wouldn’t die of anything but compassion, but yet was really masterminding a plan to destroy all the Daleks. It works in the context of storytelling, but there’s always going to be that after-image of the story that this could have been – the Death of Davros, the confrontation of age, and mortality, and philosophies and compassion standing as a last testament to the creator of the Daleks. As a grand strategy by Davros, and an even grander one by the Doctor, it actually loses quite a lot of its lasting impact. Is The Magician’s Apprentice/The Witch’s Familiar absolutely great Doctor Who? Yes, undoubtedly. Will it attain all-time classic status? That’s a little more questionable, and it’s questionable for the most part because of elements in The Witch’s Familiar. It still bowls along, delivers plenty of thrills and fun and quiet wonder, but there was an opportunity in The Witch’s Familiar to turn the two-parter into something that could never be ignored, in the same way Genesis of the Daleks can never be ignored. The death of Davros would have made all the conversation between him and the Doctor honest, legitimate, the last hopes of a desperate, dying man, recorded and recognised by the closest thing he has to a friend in the universe. By choosing the path of clever planning, and delivering an ‘Aha! I knew your clever plan was a clever plan, and planned even cleverer!’ solution, what this two-parter ends up as is cracking Doctor Who and a great series-opener, but just slightly less immortal than it could, and perhaps should have been. Still though – sonic shades? The Twelfth Doctor – what a dude!